Calitzdorp Accommodation, Find a place to stay on Route 62 between Cape Town and Oudtshoorn. 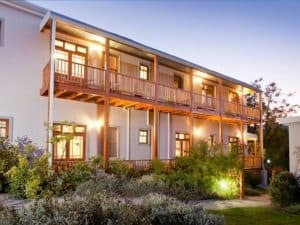 Calitzdorp in the Klein Karoo is a popular overnight stay not just because of its wine farms but also because it is a place where you can again find yourself. Peaceful and beautiful landscapes along the route 62. The rose of the Karoo on Route 62 has Reopened. 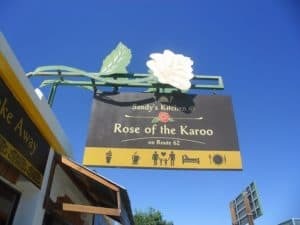 Sandy is back and has refurbished “The Rose of the Karoo”- Sandy’s Kitchen Restaurant, deli,gifts and B&B. Open from 7am till 6pm Monday to Saturday for “real coffee”, breakfast served all day-light meals, burgers, salads and shakes etc. Our deli offers many tasty treats for the weary traveler as well as “Quick meal” take aways. Our shady patio-under the vines offers tranquillity and peace. Discover treasures among our gift selection. Comfortable accommodation is offered in our air conditioned suite units. We would love to see all our familiar clients and also new ones, visit our “Oasis” in Calitzdorp..Read more. 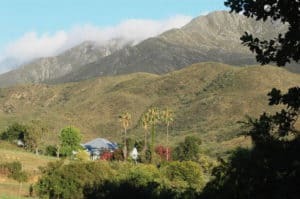 The Retreat is a Victorian farmhouse set in 560ha of the beautiful Groenfontein Valley Conservancy, bordering on the 129 000ha Swartberg Nature Reserve. The house, filled with yellow-wood and mellow Oregon pine, has a lounge and dining room – each with its own ceramic fireplace to keep them cosy on chilly winter evenings – leading onto a wide verandah, overlooking the sweeping gardens and majestic Swartberg mountains. 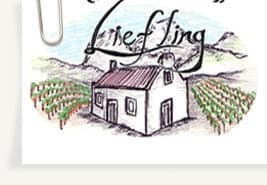 This charming guest house is situated on a smallholding producing a small quantity of wine grapes in the heart of the Klein Karoo, on the edge of Calitzdorp, 300 m off the main road and 50 km west of Oudtshoorn.